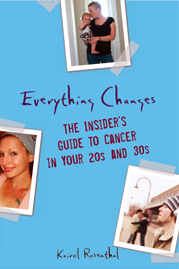 Everything Changes – The Guide to Young Adult Cancer » Feeling Pressure of ‘Life’s Too Short’? Even though I have not had cancer this article made me reflect on my own life. In the hustle and bustle of parenting life can get stressful. Thanks Sarah for writing this!!!! Thank you both for reading and for your feedback. Amy I’m so glad you were able to get something out of my post. Kim, I understand how you feel. Having cancer as a young adult is hard enough without having to deal with all the stresses life has to offer. I’m not without stress, but I do find it easier to separate the things that directly affect me with those that don’t. You’ll notice I said that I “try” to do these things. Some days are harder than others. I wish you all the best and hope that when you do find your balance, you’ll let me know your tricks. As a young person who has had cancer, I feel this is a really important issue. People who have never faced illness often romanticize “living each day like it’s your last”, and always being “in the moment”, but neither of those is a sustainable way to live. If you’re always in the moment, you can never plan for anything, never look to the future. And similar to what Sarah says, who would bother to work and pay the bills, if it’s your last day on earth? You can’t just quit reality and go on permanent vacation. I remember one guy in “Everything Changes” saying that the only real difference in the way he approaches his post-cancer life is that now, at a restaurant, he’ll order a Coke rather than just having water. To me, that actually represents a pretty profound change, a measured way of treating yourself a little better and enjoying daily life a bit more. Spending time with the people who matter, telling them that they do, and taking energy that you might have wasted on things you don’t care about and putting it towards things that you do- and ordering the Coke. I think those are pretty good principles to live by post-cancer. Thanks for the great post. This is a fantastic article, I cant wait to read more by you. I feel the exact same way, as I am sure most people who are not born to a rich family have. Trying to do my best to make a differnce with what I got though. :-) I think young people have more to worry about than older patients simply because most of us do not have an established life in that we do not have a large 401K or savings account through our nice cushy job with great insurance. We have to push forward with life while dealing with cancer and in all honesty I think with the younger age comes more issues. People also think that since you are young you can bounce right back into your old life as well which from what I have seen is not the same for older patients. Anyway, great article, you captured exactly what I feel when I read these exciting stories about survivors climbing mountains or going on yearly retreats traveling the world and I was stuck working a crappy paying 8-4:30 job for the insurance. Holly, I know exactly how you feel when you say you go from everything being great to not wanting to die. I’m still swinging between those two and it’s hard to find a happy medium between those them. I think Cat hits the nail on the head in her last paragraph. Love the blog! I took this one step further in my blog – No Chronic, Debilitating Illness? Learn to Appreciate Life–Right Now http://thepainjournal.wordpress.com. Let me know what you think. People with cancer have a serious jolt, with their life on the line in the blink of an eye (believe me, I know, I’ve lost far too many loved ones to cancer in recent years). Here’s a different question: How would your life change if you knew you’d be living the rest of your years–maybe 40 of them–in constant pain? Life is short, the good days go fast. LIVE FOR TODAY! I just wish to say several weeks ago I was diagnosed with stage IV colorectal cancer,metas to lymp and liver. The shock was overwhelming. I am only 51 years young and thought I had so much more life to live. I have been told of the short timeline that I have left and thought “what would I like to do with this time?”. After much thinking and reflecting back on my life I realized that I have had lots of great years and good times. I have decided to be gratefull for the times I had and will spend the time I have left with the great family and friends in my life that made my journey what it is. There will always be somethinng you might feel you missed out on if you spend to much time feeling sorry for yourself. I chose to make the most out of my unfortunate situation. I hope this helps others with their suffering and lost feelings to appreciate what you had and be thankful for the time left to spend with loved ones. There is never a good time for this kind of news. My wishes of well to all.